Spring has finally sprung around here and it feels like time to celebrate. This Paleo Key Lime Pie was inspired by the beautiful green hues that emerge as spring arrives. 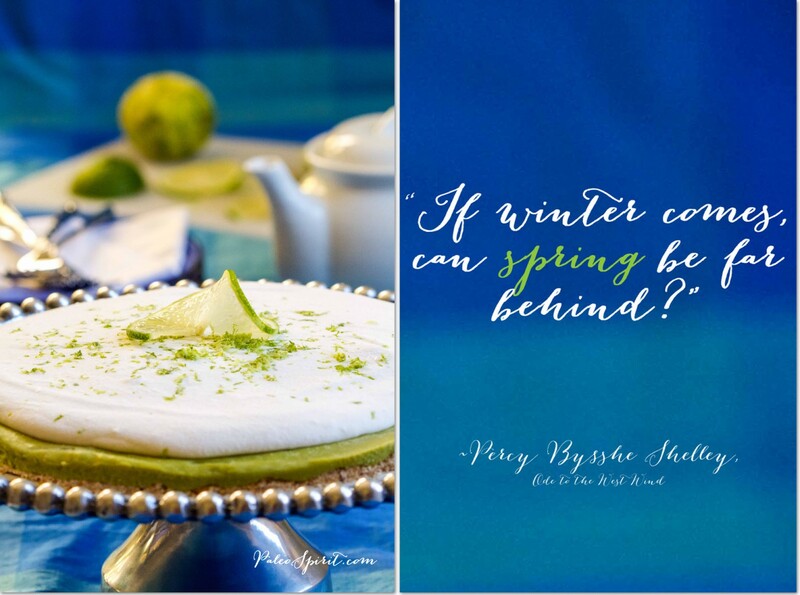 Far from the hearty stews, braised meats, roasted veggies and even rich dark chocolates featured in our kitchens and dotting the food blog landscape in winter, this key lime pie feels a world apart and just right for spring! The other inspiration for the pie came about after an email from a woman desperately hunting for a birthday dessert recipe for her friend. The trouble, you see, is her friend is Paleo AND vegan. And if that wasn’t challenge enough, the friend is also allergic to nuts. Impossible, you say? Well, at first I thought it was but keep reading and you will see the ingredients that make this dream come true. The day after I made the pie we had a scary experience with our youngest son. We thought Nathaniel had managed to dodge the allergy bullet. We found out the hard way that is not the case when he ingested a bit of walnut and ended up needing an Epi-Pen injection to stop his throat closing up. Thank God he is fine now and I will write more about what happened in a future post. But it seemed all the more fitting that we have a paleo dessert recipe that is safe for almost anyone. 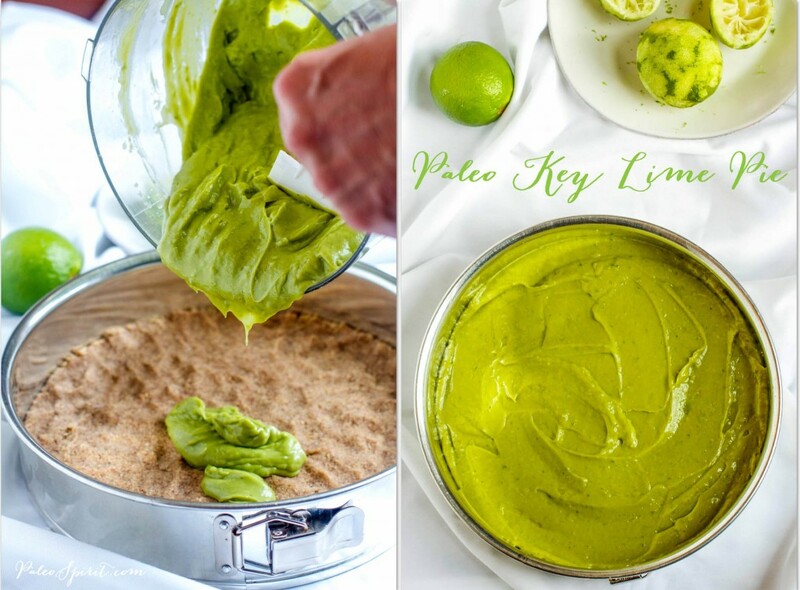 The Paleo Key Lime pie has no dairy, no nuts, no eggs, no soy, no grains and free of refined sugars. 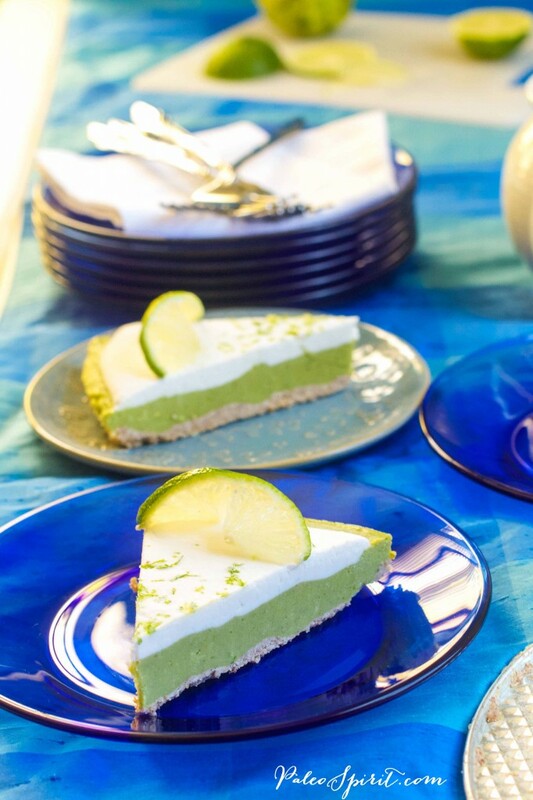 The taste is tart and refreshing and you will never detect the main, and surprising, ingredient – avocados. Make sure your coconut cream is very cold (fresh from the refrigerator). Add the coconut cream, raw honey (or coconut nectar or other vegan sweetener) and the vanilla to a stand mixer and process slowly until combined. Continue processing a few more seconds on high speed until the coconut cream is like thick whipped cream. 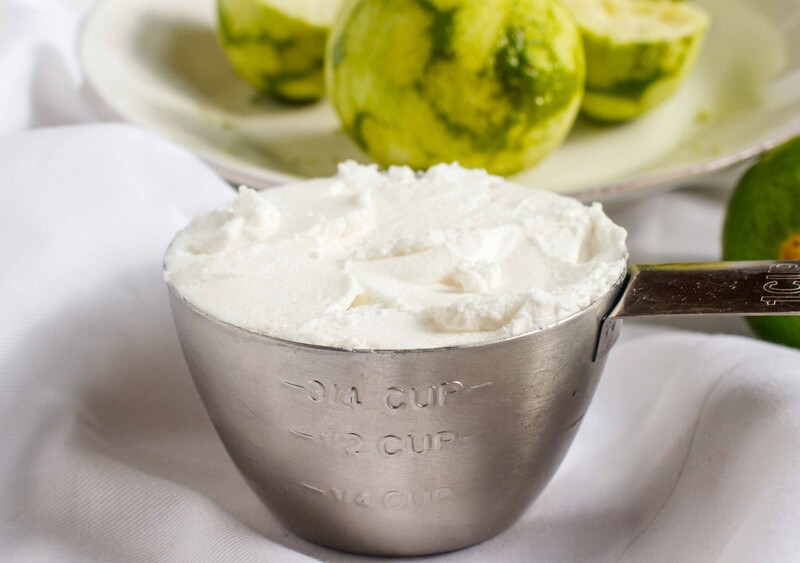 Once your coconut cream topping is whipped, you can pour it onto the prepared key lime pie and spread. 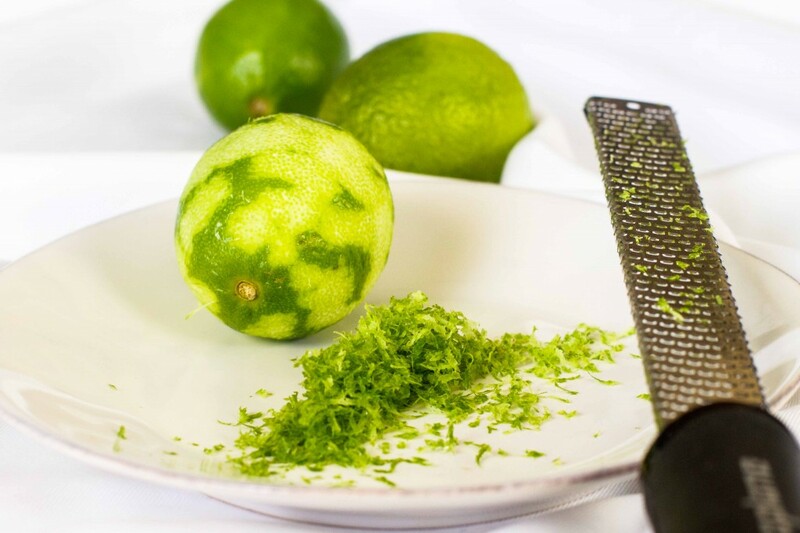 Top with additional lime zest and slices of fresh lime for a beautiful presentation. You can also refrigerate or freeze the pie and serve later. I froze the pie overnight then thawed and served it the following day. We then refrigerated the leftovers (they didn’t last long!). 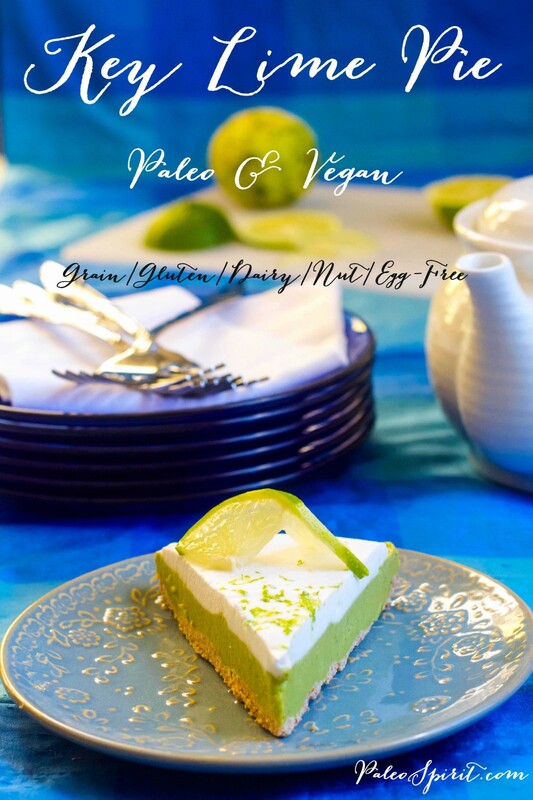 The taste of this paleo key lime pie is so tangy and full of lime flavor you should not detect the avocado flavor. I love that the pie, though full of fat, is full of healthy fats and relatively low in sugar. The pie comes close to qualifying as a raw dessert. There are a few modifications that could be made to make a completely raw dessert but given the challenge I was facing already I figure I will leave that to another day. Enjoy the pie and PLEASE let me know what you think and if you try it tell us how it goes. Do you or your family or friends struggle to find paleo-friendly recipes that meet your allergy restrictions? Will this help you out? Let us know in the comments. Subscribe to Paleo Spirit by entering your email address here. Check your spam folder if you do not immediately receive a confirmation email. 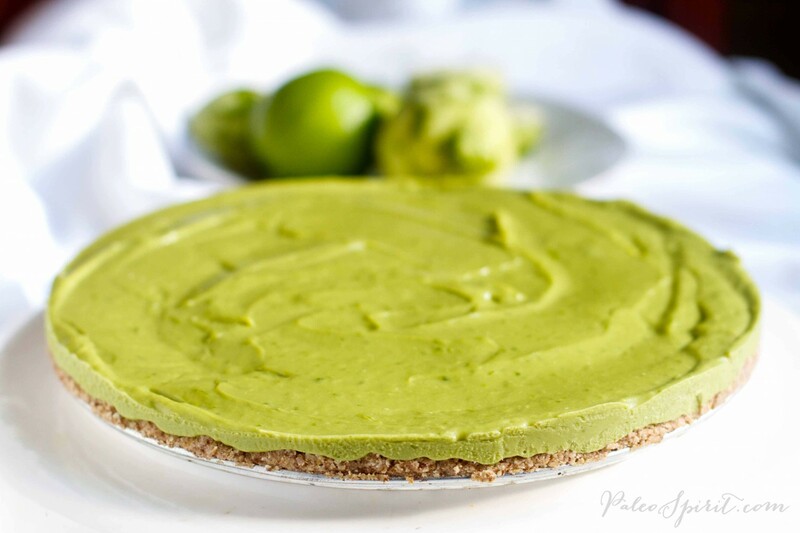 31 Responses to "Paleo Key Lime Pie: Dairy-free, Nut-free and Vegan"
Wow, that is a pretty inclusive kind of pie. Well done for catering for your reader’s needs. I have not cooked with (or seen) coconut crystals before – are they sweet like sugar? I’d like to suggest please please please for you and any reader or conscious being to PLEASE research on how coconut sugar or “crystals” is made. Coconut trees CANNOT produce both coconuts and coconut sugar at the same time. Farmers are converting their trees to produce this “in demand” sugar, which if this continues will drive our coconut, coconut water and oil and all its other wonderful goodies skyrocketing! (Obviously because there will be less trees producing these items) for some crystals which there is NO scientific evidence nor studies proving its ANY lower on the glycemic index than table sugar. Coconut sugar actually does have a lower glycemic index than other sweeteners because it contains inulin. I am a type 1 diabetic and I tolerate coconut sugar just fine, whereas I cannot tolerate honey, maple sugar, or beet sugar (which is usually genetically modified) because they spike my blood sugar. This is not only true for diabetics – others who have sub-clinical blood sugar issues often also notice brain fog and dropping energy levels when using these sweeteners. Just because they are natural does not mean that they are good for everyone. That being said, I appreciate the fact that we do need to be conscientious about the environmental impact of our use of exotic ingredients such as coconut and palm which come from far-away lands and are often produced under less-than-sustainable conditions. I am so excited to try this! My friend that got me started on Paleo for my fibromyalgia, found this and sent it to me. She remembered I said I LOVE key lime pie and that it’s my favorite dessert! Well..besides brownies..lol AND dark. Chocolate. Thanks for creating and posting! 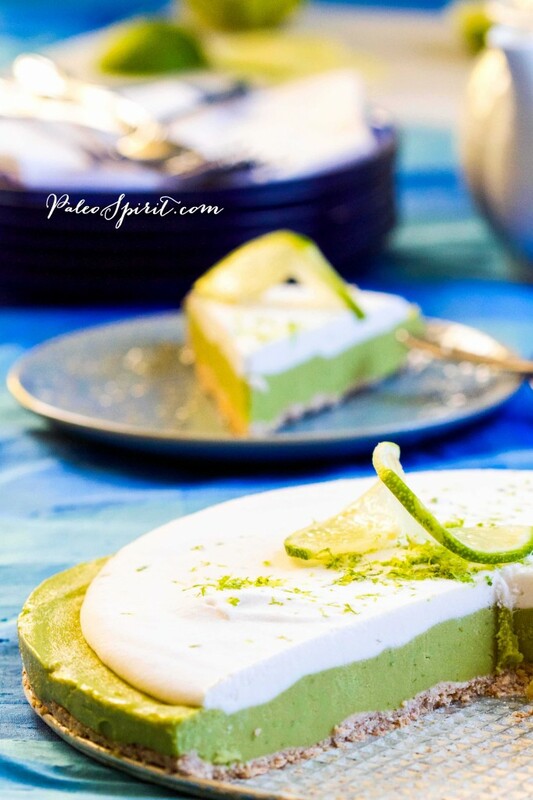 I love Key Lime Pie and would like to try this recipe. Could you add a “Printer Friendly” button so I could print just the recipe? If you look WAY down at the bottom of the post there is a “print friendly” button. You click that and then delete the pieces of text and photos you don’t want to print. It’s easy to miss since it’s not right by the recipe instructions. Wow! Congratulations! What an inspirational recipe. I love it and cannot wait to give it a try myself… 😉 Thank you so much for sharing. What a gorgeous dessert – my question is this – where do I buy coconut cream??? I’ve heard it called creamed coconut before but I’ve been unsuccessful in ever finding it to purchase. Coconut cream and creamed coconut are not the same. Coconut cream is really just the cream that rises to the top of a can of full fat coconut milk. Sometimes you can find cans of just the cream (I found it at Trader Joe’s). Creamed coconut is coconut meat and cream that has been processed together. It has more of a concentrated coconut flavor and texture. You wouldn’t want to use that for this recipe. Just get a can or two of good quality, full fat coconut milk, refrigerate and use the cream that is solid at the top of the can. This was a GREAT recipe!! I made it for my husband who eats Paleo, and although it took some time, it was WELL WORTH IT!! 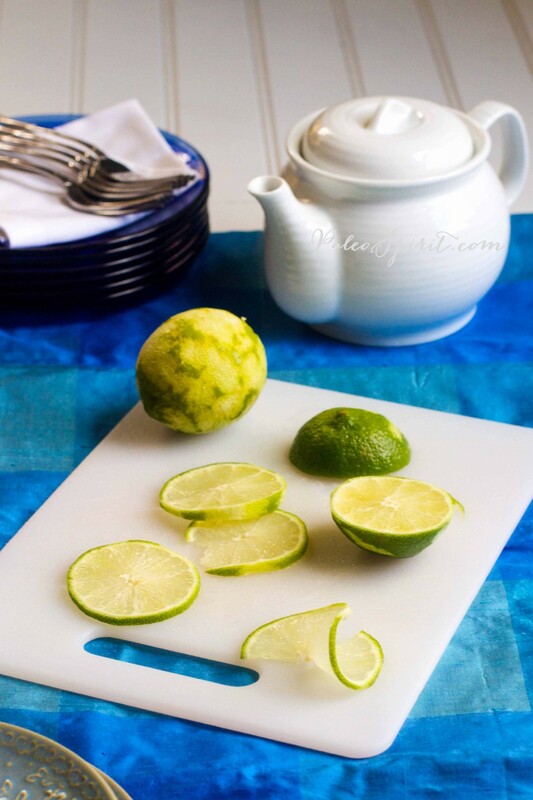 VERY tangy and sweet!! Now he wants me to make it all the time! 🙂 Thank you for the recipe! This looks great! Do you think you could use chia in place of the flax in the crust? Flax and I are not the best of friends. 😉 Thanks! I haven’t tried using chia but I bet it would work. Maybe try looking online for a recipe for an egg substitute using chia. Hi Lea!–I’ve shared this stunning recipe that works for so many eating plans over at All Gluten-Free Desserts. 🙂 I’m so very happy to have you as one of our featured contributors! p.s. Bummed I couldn’t make it to the Beyond Bacon release party (only about 90 minutes away) to meet you and so many others. It looked like it was a blast! Shirley! I didn’t realize you we’re so close to that event. It would have been great to meet you. We were with family in OC, MD and drove over for the party – we live in NJ. Thanks for sharing the recipe. I need to remember to grab that icon for your site. so, you don’t bake the crust before dumping in the filling? I’m confused. It’s a raw crust? Yes, you don’t cook the crust. I hesitated to call it “raw” because I don’t know if arrowroot and coconut flours would qualify as technically a raw food. This pie looks delicious! 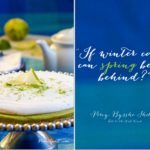 Beautiful pic and recipe. Wow! Thank you! We are wheat-free in our house, and one child is allergic to nuts and eggs, whilst another reacts to lactose – it can be a challenge to make a ‘cake’ at birthdays. This looks divine. I’d like to use shredded coconut already in my pantry rather than purchase the flakes – is there any reason using shredded may not work? Is there an alternative to the coconut crystals? Don’t think I can get my hands on them quickly in the UK – and will be trying this recipe out for family dinner tomorrow! You can use any other form of sugar you prefer like brown sugar or even standard white sugar. I just used coconut crystals because it supposedly has a lower Glycemic index and more minerals. Is there an alternative to coconut cream? The only alternative to the coconut cream that I can think of is whipped dairy cream. Of course, that is assuming you eat dairy. Other than that it’s a bit tough to get something thick and creamy enough for this kind of topping. If you do use the coconut cream from a can of full fat coconut and have coconut milk/water left over you can use that in smoothies. Just a suggestion. I hope that helps. As a pregnant mama, I had been craving this but had NO idea how I’d incorporate it into my menu. Just wonderful! 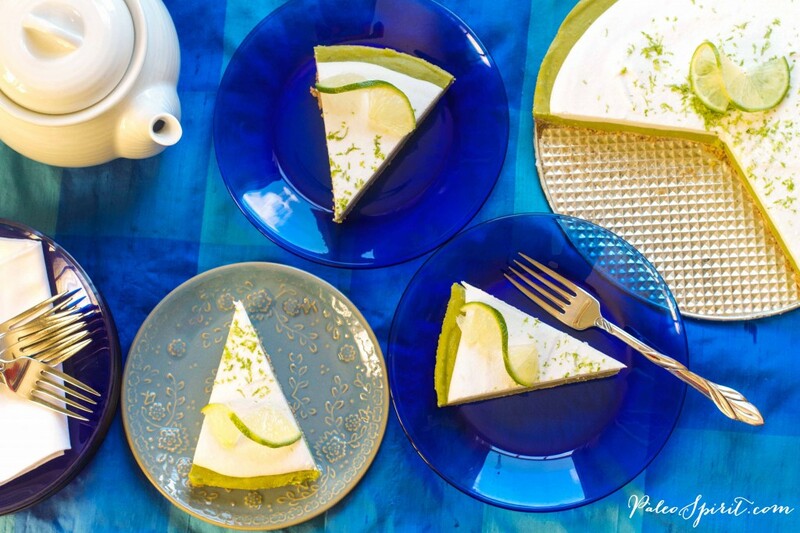 I have been recommending your Key Lime Pie because it was a real success at our house! I really liked it slightly thawed out of the freezer. Kids had no idea that their least favorite avocados were the main ingredient! I’ll be adding it to my Whole30 Menu plan I’ll be sharing on my blog with a link back to here. Thank you so very much! Great, Melissa. So glad you liked it!